Anyone that has followed my blog for awhile knows that we have a TON of Queen butterflies in my yard. It has a lot to do with all of the milkweed species we have, and our warm Arizona weather. This has afforded me the opportunity to take great close-ups of Queen caterpillars, Queen pupa, and the butterflies themselves. One warm December day last weekend I had two great opportunities. The first was to watch an adult Queen "warm up" as the day progressed. 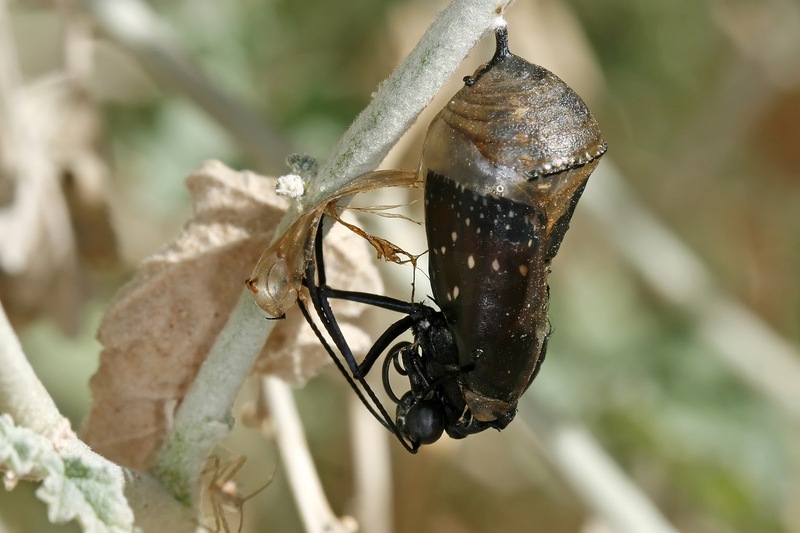 The latter was the emergence of a new adult from its chrysalis. The morning started around 40 degrees, and warmed to the mid 70's by afternoon - plenty warm enough to get the Queen moving. But before that it sat motionless on a low shrub, allowing for some spectacular close-ups. I didn't quite get the depth of field I wanted in the head shot above, but it is still a nice close-up. 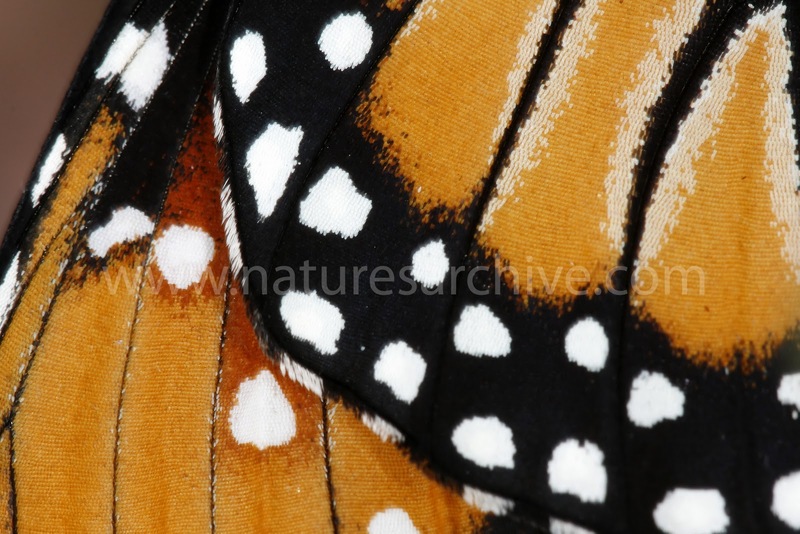 However, this wing shot below turned out much better - you can see individual scales with great detail. Be sure to click on it for a full size view. Now for part two of the story - the chrysalis. 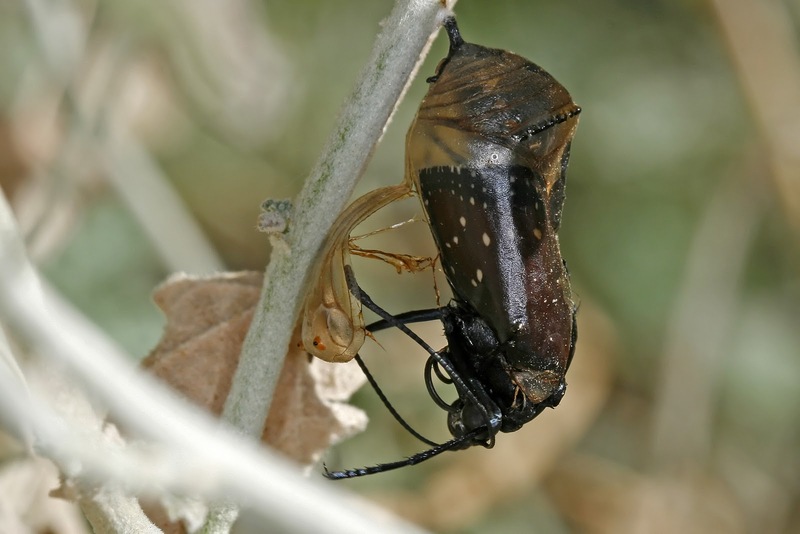 We'd noticed a couple of chrysalis in early to mid November and had wondered how they'd handle the cold winter. We had a couple of nights around 24 degrees in Maricopa, and the daytime highs were in the low 60's for quite awhile - not quite warm enough to trigger the metamorphosis. But a string of warm weather - lows in the 40s and highs in the 70s, was enough to trigger one successful emergence - which we missed. 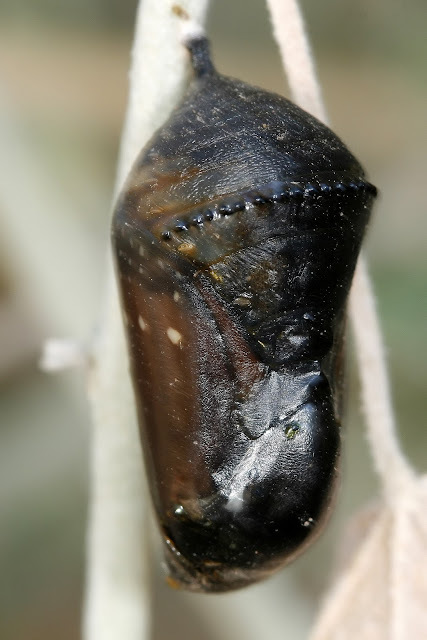 A few days later we noticed the second chrysalis was turning dark- a sign the butterfly inside was almost ready. You can see the butterfly's wings wrapped up tightly inside the chrysalis, with the white spots standing out and some hint of orange. There is also some indication of its head towards the bottom. When the sun moved to the point where it was shining directly onto the butterfly, it sprang into action and started working its way out. Unfortunately, the sun only shined on it for about 90 minutes before the shade of a nearby house engulfed the butterfly. Without that energy, it started to slow down and stopped - unable to fully extract itself. I wasn't sure whether to intervene or let nature takes it course. I thought that maybe there was a slim chance that the next day, when the sun shined again, it would be able to complete its extraction. In retrospect, it was silly to think it could survive half extracted. When I checked it the next day, it was dead and already shriveling up. I'm not certain why it ultimately failed, but I suspect if it had another hour or two of warm sun it would have made it. Wow this is super close and love the colors too. Great info. How amazing! I love watching this mystery in action! Hope you had a wonderful Christmas! Wow, these are wonderful macros with such great details! these butterflies are so common here, and so are the milkweed flowers. Tough choice. It's hard to second guess Mother Nature. Great macros. I love Queen butterflies though they are rare here in Houston. Great details in these macros. 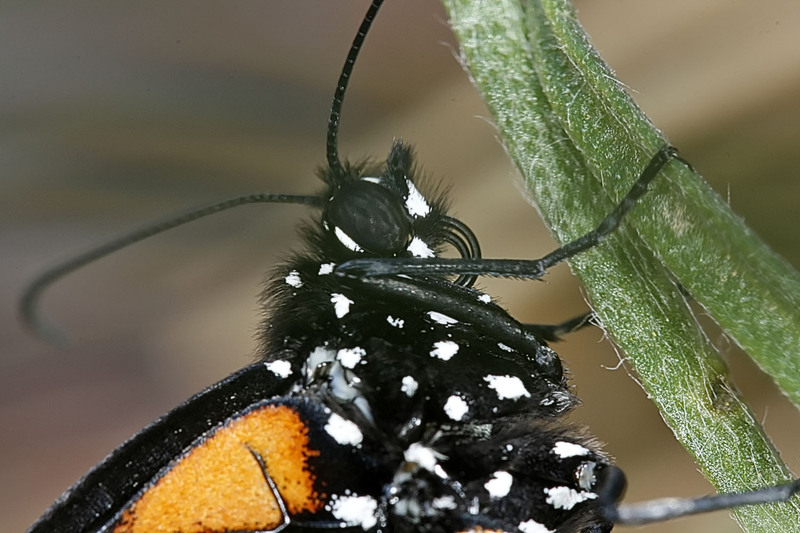 I love the butterfly macros. Happy new year!!!! simply beautiful !!! what a macro ! I love the one where we can see the coloured scales of the wing ! bravo ! and happy New Year ! Wow...that's so sad, but what an amazing thing to witness. The photos are stunning! Great post- the wing closeup was amazing. It looks like it is made of beads. Love the narrative- thanks for sharing it. amazing to watch transformation as it is happening...so beautiful!